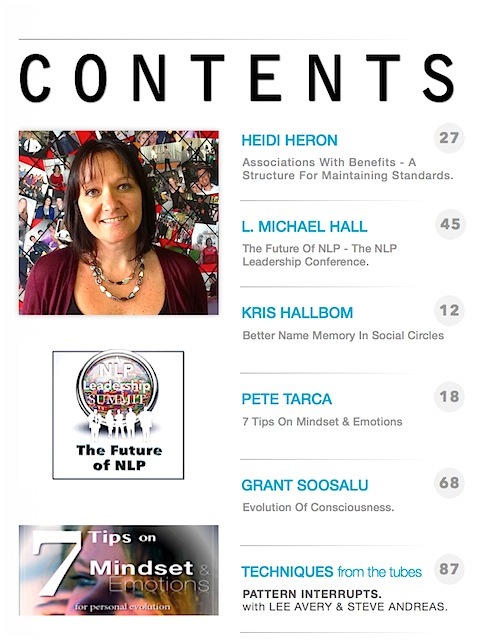 * HEIDI HERON, Chair of the Australian Board of NLP looks at the future of the industry and the active and valuable role associations are playing. * L. MICHAEL HALL Ph.D talks openly about the NLP Leadership Summit, and we see input from NLP founders and notaries regarding their opinions on the FUTURE of NLP. 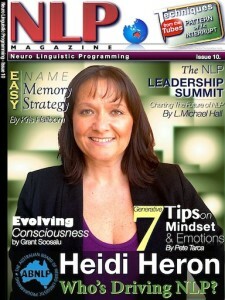 * KRIS HALLBOM Helps you empower your social ability to Remember Names with this simple yet powerful Name Memory strategy. * PETE TARCA shares 7 Insightful TIPS on the affect of Mindset on Emotions and introduces the concept of PSYCHOSTASIS – the role of emotions as a measure of personal evolution. * GRANT SOOSALU – EVOLUTION OF CONSCIOUSNESS: Neuroscience on brain plasticity shows that as we progress toward greater self-actualisation, we can create entirely new neurological structures never before seen on this planet – a new paradigm approaches. * TECHNIQUES: LEE AVERY and STEVE ANDREAS explore the structure, process and often unused influence of Pattern Interrupts.